While in the Plymouth area, Pring's men loaded the ships with sassafras, which brought a high price for use by the medical profession in Europe. 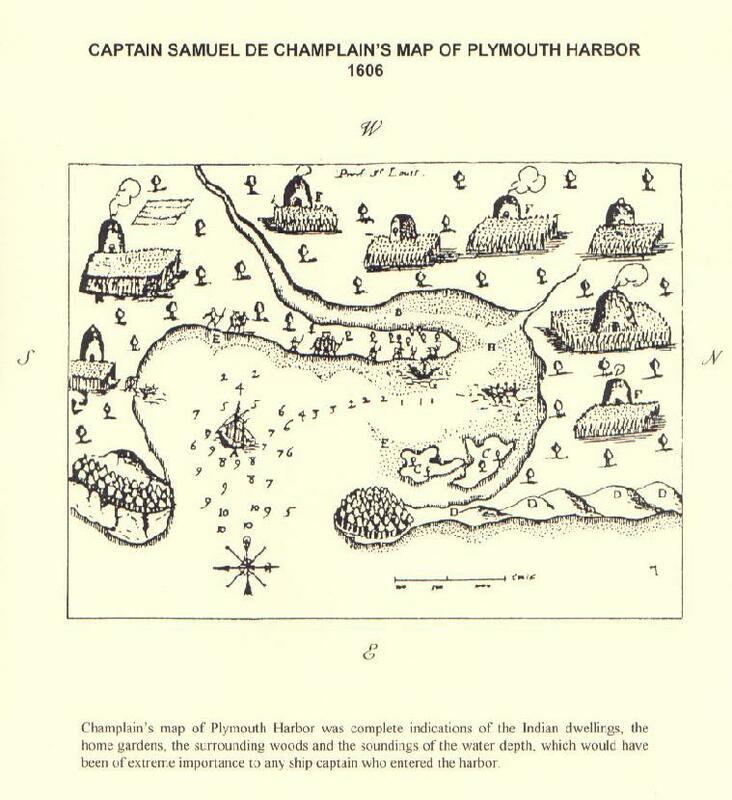 The drawing provided by Samuel de Champlain when he visited the Plymouth area in 1604 shows the area to have been cleared except for scattered trees. He pictured native dwellings with their gardens around the harbor. The only two points which show groves of trees are the two points of land at the harbor entrance. The remainder of the land area had been cleared for habitation and gardens. By the time the first Europeans visited the New England coast, the Indians had already cleared thousands of acres for the cultivation of crops. To clear the rocky and wooded land in New England would have been a major undertaking with only stone axes and fire at their disposal. For easier cultivation they chose areas with lighter soil. In those places the trees were likely to be pines and soft woods, not oak and walnut. After chopping into the trunks of pine and other evergreens as far as they could with their axes, the Indians piles brush and dry branches around the trees and set the pile ablaze. When the hot fire burned into the trunk a distance, they cut and burned again, assisted by the flammable pitch in the sap. Once the trees had been felled and dried, another fire was set to reduce the logs and branches to ash. The coating of wood ashes on the ground was rich in phosphates, lime and potash which provided ideal nutrients for healthy crops. When a forest was mostly hardwoods, or an easier method was preferred, the Wampanoag People might strip off the bark, girdling the trees to kill them. This method reduced the foliage and allowed sunlight to reach the first crops. Having cleared the sandy and gravelly loam of their cleared garden areas, the soil was easy to work by hand. After the land was prepared for agriculture, the Indians might keep it arable for generations through the practice of allowing the land to lie fallow occasionally. In the spring after the danger of frost had passed, the Wampanoag People began to prepare their fields. According to tradition, they looked to the signs in nature. In early spring the Wampanoags watched the leaf development on different types of trees. The leaves of the oak trees should be the size of a mouse's ears, or those of the dogwood and service berry should be the size of a squirrel's ear. The men and women cleared the fields and the women usually planted the seeds. All crops were planted together in the same plot. They planted the corn in “corn hills,” spaced about three feet apart. From three to five kernels of corn were planted together. The Indians used spades of shaped rock and hoes made of sea shells or the shoulder bones of deer or other large animals to move and scoop the soil. After the corn hills had been fertilized with the fish, it was necessary to watch over the fields at night to prevent wolves and other scavengers from digging up and eating the fish. This night watch continued for about two weeks until the fish had rotted. When the corn had grown to about the height of a finger, three or four beans were planted around the corn hills so the growing bean plants would climb the stalks and add support as they both matured. Squash and pumpkin seeds were planted in the areas between the corn and bean hills. At that time a little earth was moved up around the base of the corn stalks to help support the growing stalks. After this “hilling” of the corn they would not meddle with the crops until harvest time. As the squash and pumpkin vines grew their vines trailed across the ground and their broad leaves protected the soil from direct sunlight which discouraged weed growth and prevented some moisture evaporation from the soil. Blackbirds caused more crop destruction than any of the animals. In order to prevent this kind of destruction, the Wampanoags built watch houses on stilts in the fields. From these structures the women and children could scare away the birds with loud noises. The Indians would not kill the crows because of the tradition of the Crow bringing the first corn and bean to the people. All of these crops required the Wompanoag's constant attention during the growing season. The Wampanoag therefore labored to clear, plant, weed, and watch over their fields. If they did not tend their fields, other plants would spread and choke out the crops, and animals such as crows and mice would devour seeds and young crops. 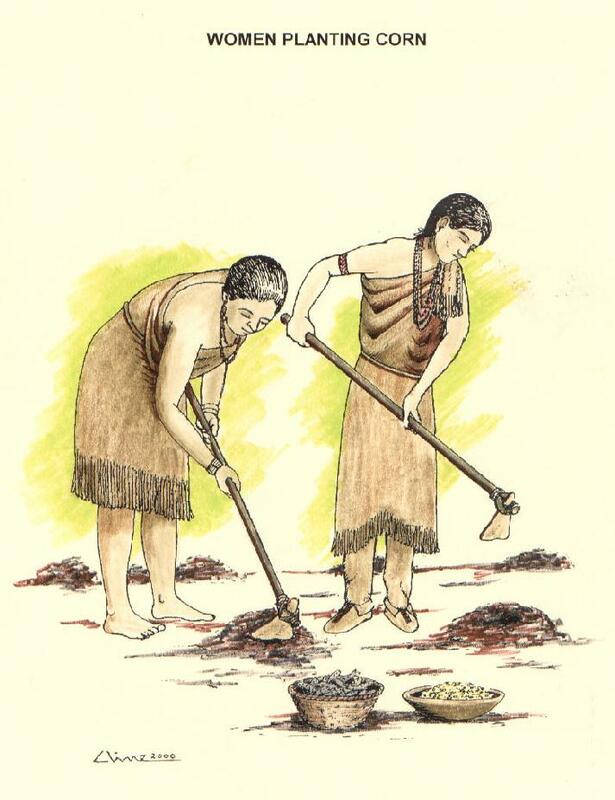 The Wampanoag had several types of tools for farming: spades (flat shaped stones for root digging), hoes, and stone dibbles or digging sticks used to make holes for seeds. 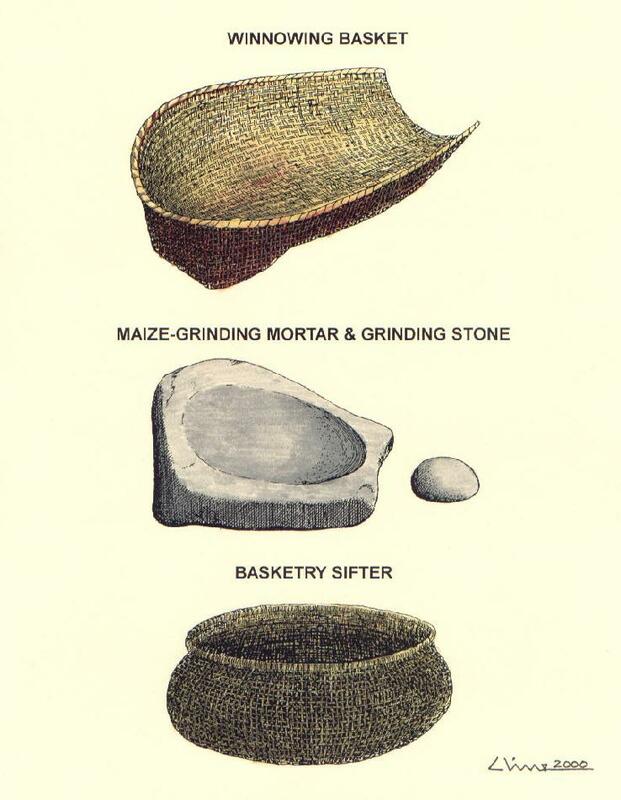 Roger Williams described three kinds of hoes used by the Indians: a hoe for general use [anáskhig], a weeding hoe of either clam shell or deer scapula or shoulder bone [monaskunnummautowwin], and a “breaking-up” hoe [anankhommwáutowwin] made of stone that was triangular in shape and probably used to help tear out the stumps of tree that had been felled to clear fields. The Wampanoag People grew a number of cultivated crops. Most were edible crops, but they also raised gourds and tobacco. Corn. Ewáchim-neash was the word for corn in the Indian language. Winthrop wrote: “Nature hath delighted itself to beautify this Corne with a great variety of colours.” The chief variety of native corn in the Cape Cod area was the northern flint variety usually in either white or yellow colors. In the northern flint each plant only bore two, relatively short ears with only about eight rows of kernels and 30 to 40 kernels in a row. As Winthrop noted, there was “a great variety of colors including white corn, black corn, cherry red corn, yellow, blue, straw-colored, greenish and speckled.” The northern flint corn stalks grew from four to six feet high. There was also a variation in the colors of the stalks for these plants. All parts of the corn plant were used by the Wampanoag People. Nothing was discarded. The husks were braided and woven to make sleeping mats, baskets and corn husk dolls. The cobs were used for fuel, to make darts for a game, or were tied to a stick to make a sort of rattle used in ceremonies. Beans. Manusqussûdash in the Indian language were of several colors: white, red, yellow, blue, blue-spotted. John Josselyn, the colonial herbalist, stated, “They are variegated much, some being bigger a great deal than others.” The vines that grew them varied also. Some of the low sort were apparently bush beans. Others were planted in the cornfield to climb the stalks. Some varieties were eaten fresh, others were dried and stored for winter use. Squash. Askútasq (pl., askútasquash) as it was known to the Indians (meaning to be eaten green, the prefix Ashq meaning “not yet,” or “unripe.”) Roger Williams elaborates as follows: “Askutasquash, their Vine aples, which the English from them call Squashes about the bignesse of Apples of several colours, a sweet, light wholesome refreshing.” Interestingly, John Eliot uses the same word for cucumbers. Wampanoag squashes included the bush scallop, white bush scallop, and zucchini. The summer crook neck which matured in midsummer had a soft pulp. The winter squashes such as hubbards and acorns matured in the autumn and had a firmer pulp, which made them suitable for cutting into pieces and drying for winter use. Pumpkins. Pumpkins were known to the Indians as pompion. The Indians had both sugar and field pumpkins. Like the winter squashes, the pumpkins could be cut into pieces and dried for winter use. Melons. Known to them as monskotosquash, the Indians may have had several types of melon. The watermelons were probably of the smaller variety. Râle uses the word ohhosketámuk as the Indian word for watermelon. Rev. Edumd Browne of 17th century Sudbury describes as “naturally growing” “a muskmelon...soe ripened with the sunne as with both smell and taste it may compare with goodly pears.” Cartier in 1535 mentioned “muskmillions” more than once, differentiating them from pompions, gourds and cucumbers. Jerusalem Artichokes. This is a native wild plant (much like a sunflower) which produces plentiful tubers in good soil. However, the tubers could be gathered from plants which grew in the wild. Champlain noted their taste to be similar to an artichoke. The tubers stand hard freezing in the ground and could be dug all winter. Groundnut. A potato-like root, the groundnut was cultivated by southern New England Indians. Whether the Indians cultivated the groundnut, or merely encouraged the native wild roots is uncertain. They did, however, dry and store the tubers to be eaten later. Gourds. Known to the Indians as quonoasquash, the gourds were not cultivated to be eaten, but when mature gourds of various sizes were dried they provided dippers and hollow containers which could be used to hold food or used to store other items. The first harvest of the season took place about four months after planting. The young, green corn and the first squashes and beans were then ready to cook and eat. At the time of the early harvest the Wampanoag held a green corn ceremony to thank the Creator for the first fruits of the season. To supplement their diet, the Wampanoag People also gathered a number of wild fruits, nuts, vegetables and herbs. Foraging by the women and children provided food all year. In the late spring and throughout the summer a variety of berries were ripe and ready to eat. They also gathered wild leeks and onions during this time. The roots of the groundnut were dug in late summer. Acorns and chestnuts were gathered in the fall, and the tubers of the Jerusalem artichoke were dug in the late fall and through the winter. 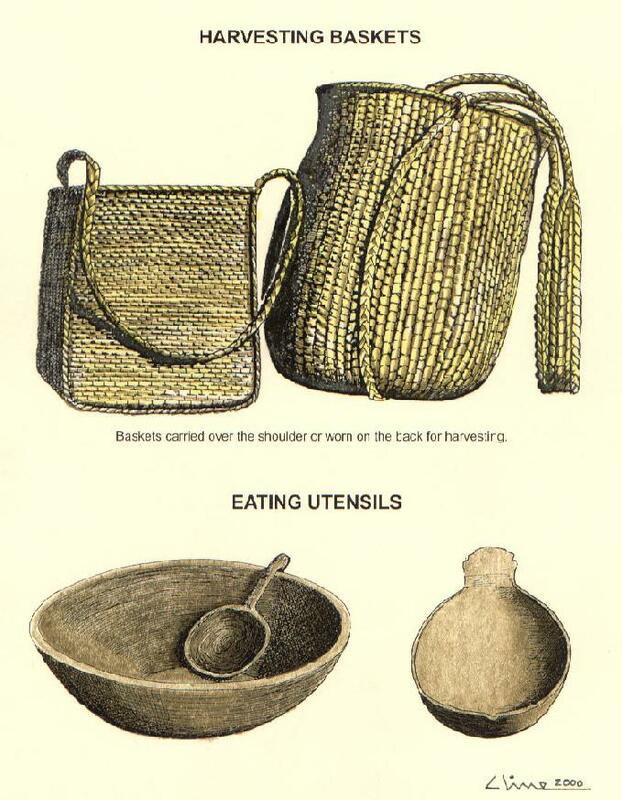 Hunting, fishing and foraging supplemented the Wampanoag diet. The hunting season began almost as soon as the harvest was over. The men hunted large game such as deer, bear, and occasionally moose (southeastern New England was at the southernmost extent of moose territory, so they were not common). 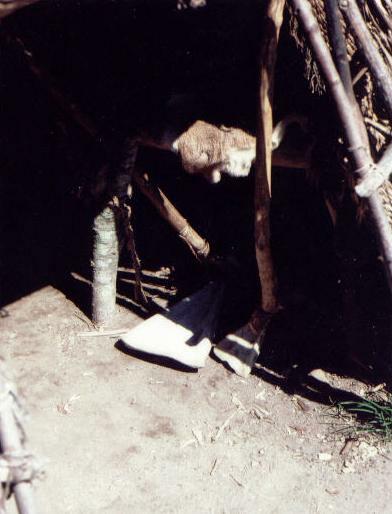 The men also caught small game such as beaver, racoon, rabbit and muskrat. Another method of trapping used by the Wampanoag was the hedge drive. Some Wampanoag men and boys would chase the deer into a narrow passageway between hedges and trees. Other hunters waiting at the end of this gauntlet to spear the deer which were hemmed in. Fishing was second in importance to agriculture as a source of food for the Wampanoag. Although spring and summer were the best times for fishing, fish could be taken year round from both rivers and oceans. Shellfish of many kinds were available all year, too: oysters, scallops, soft-shelled crabs, quahogs (hard-shell clams), and large sea clams. Lobsters were not eaten but used as bait for more favored types of fish. “Their fishing follows in the spring, summer and fall. First for Lobsters, Clams, Flouke, Lumps or Poillce and Alewives, afterwards for Bass, Cod, Rock, Blue-fish, Salmon and Lampres, &c. “The lobsters they take in large Bayes when it is low water, the wind still, going out in their Birchen-Cannows [canoes] with a staff two or three yards long, made small and sharpened at one end, and nicked with deep nicks to take hold. When they spy the Lobster crawling upon the sand in two fathom water, more or less, they stick him towards the head and bring him up. I have known 30 lobsters taken by an Indian lad in an hour and a half. “Clams they dig out of the clam banks upon the flats and creeks when it is low water, where they are bedded sometimes a yard deep one upon another, the beds a quarter of a mile in length. “The alewives they take with nets like a pursenet put upon a round hoop'd stick with a handle in fresh ponds where they come to spawn. “The Bass and bleu-fish they take in harbors, and at the mouth of barr'd Rivers being in their Canows [canoes], striking them with a fish gig, a kind of dart or staff, to the lower end whereof they fasten a sharp jagged bone with a string fastened to it, as soon as the fish is truck they pull away the staff, leaving the bony head in the fishes body and fasten the other end of the string to the Canow; Thus they will hale after them to shore half a dozen or half a score great fishes, this way they take Sturgeon. “In dark evening when they are upon the fishing ground near a Bar of Sand (where the Sturgeon feeds upon small fished like eels) the Indian lights a piece of dry Birch-Bark which breaks out in flame & holds it over the side of his Canow, the Sturgeon seeing this glaring light mounts to the surface of the water where he is slain & taken with a fish gig. The Wampanoag took freshwater fish from New England's many lakes, ponds and rivers. Some ocean fish, such as alewives, herring and bluefish, migrated inland to these freshwater sources to reproduce and could be take there. They caught fish with spears, lines of twisted plant fiber attached to bone hooks, nets made of plant fibers, and weirs, fence-like structures of long wooden stakes built across a river or stream. Only the large fish were killed with spears. 1. 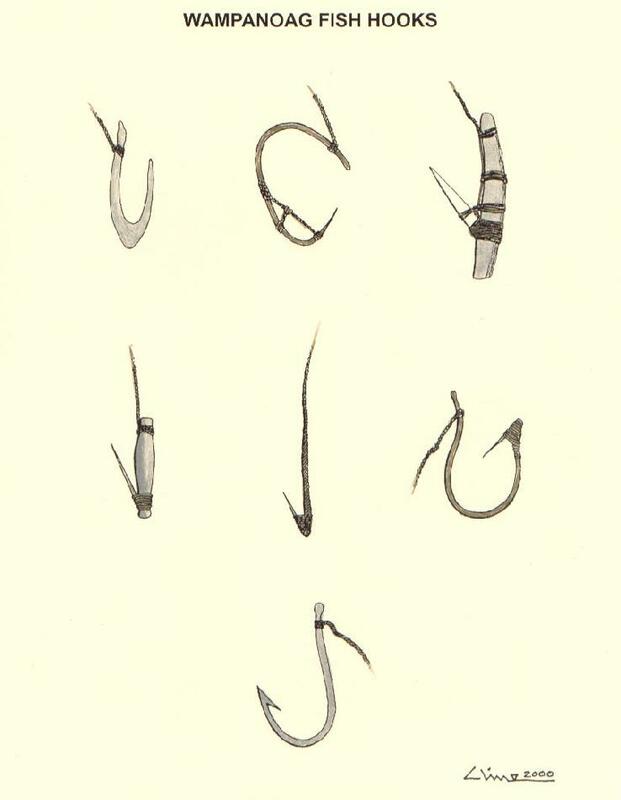 The gorge hook, a simple spike of bone or wood sharpened at both ends and fastened in the middle to a line, a device used also for catching birds. 2. The spike, set obliquely in the end of a pliant shaft. 3. The plain hook. 5. The barbed hook combined with sinker and lure. 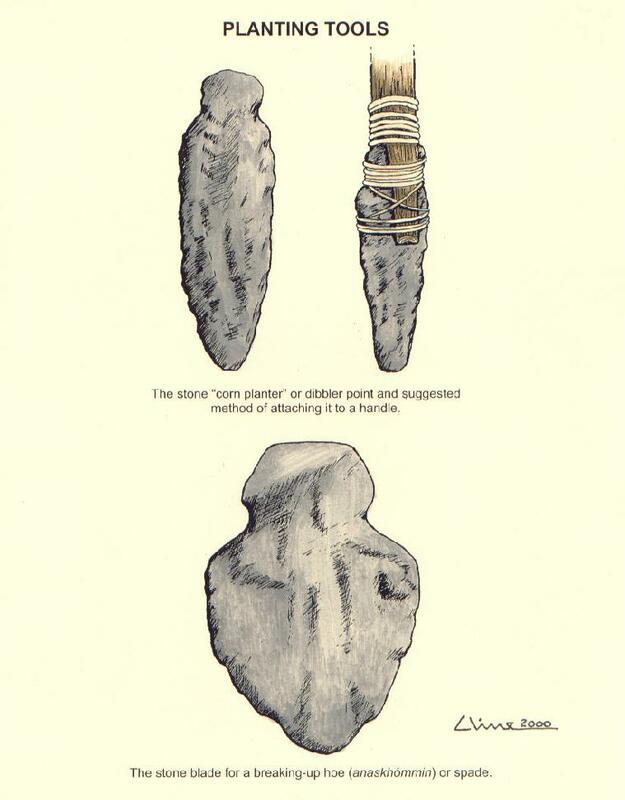 The materials used for hooks by the Indians were wood, bone, shell stone and copper. Lines and poles varied with the customs of the fishermen and, the habits of the fish. One of the first things we learn about the Native Americans is how they taught the early colonists about the essential crop of corn; showed them how to grow it; and, how to use it. From time to time in historical records we find references to parched corn. During the Starvation Time of the Pilgrims at Plymouth Colony in 1622, food was so scarce that each colonist received only five kernels of parched corn per day. Yet, this time-honored method of cooking corn has been nearly forgotten in today’s world. Parching corn is similar to popcorn, in that kernels pop loudly when heated, but parched corn is not popped corn as some might think. True parching corns are varieties of flour corns, and their kernels are soft and dry when mature. When heated slowly, they expand only slightly, and the seed coat usually splits. The word “parch” comes from Old English, and means “to make dry.” In parching corn the kernels are cooked slowly until they soften and expand, but do not explode as with popcorn (see illustration below). Popcorns are flint corns, and their hard brittle kernels explode and expand in volume when heated. In early times the Native Americans parched their corn in earthenware pots over an open flame. By the 19th century as settlers made their across America many of the pioneers parched corn in iron kettles or skillets. With today’s technological advances, corn can be parched successfully in a microwave oven. Parching corns are much sweeter and more flavorful than popcorn and don’t need added oil or salt to enhance their flavor. Although any flour corn can be parched, there are only a few varieties which are recommended for taste. White corn varieties tend to be bland; yellow corn usually has a disagreeable aftertaste; and, the black varieties are not at all pleasant to the taste. Not all red or purple flour corns are great parching corns. The best ones become sweet as you chew them, have tender skins and delicious flavors. Native Americans grow these red and purple varieties specifically for parching. Spread a layer of kernels in the bottom of a skillet with no oil, and place over low heat. Stir the kernels as they cook to prevent burning. Stop the cooking when the popping has mostly stopped, but not completely. You can stir the corn by shaking the pan on the burner as you might with popcorn. The parching takes about five minute using this method. Place about 1/4 cup of plain kernels on a thin plate and cover with a paper plate. Micro- wave on high for 3 minutes. Stop the cooking when most (but not all) of the popping has completed (which may be only one to two minutes depending on the variety, moisture content and power of the oven). Uncooked kernels of parching corn don’t have to be separated from the cooked kernels because they are soft and tasty even when raw. 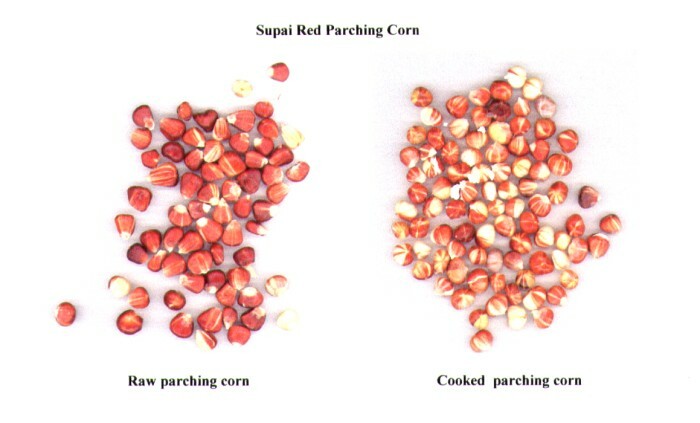 One of the better varieties of corn recommended for parching is the Supai Red. In the two photos below of parching corn before and after cooking, you will notice there is very little difference in their appearance. Seed corn for Supai Red is available from Seeds of Change, P.O. Box 15700, Santa Fe, NM 87506-5700. A number of commercial companies sell snack foods which are identified as parched corn. However, most are oiled and salted, or are included in trail mixes. For those wishing a taste of unsalted parched corn, or for use in remembrance of “The Five Kernels of Corn” observed by the Society of Mayflower Descendants, simple, unsalted parched corn can be ordered by the pound from Blue Heron Mercantile, 4202 Hillsdale Drive, Lafayette, IN 47909.